I wonder how many of you living in West Hallam can remember the cottage in the photographs? This was situated on the north side of the High Lane, approximately half way between Mapperley and West Hallam crossroads. (Note High Lane was split into West, Central and East in recent times). The cottage was known as 'Orchard Farm' and belonged to Mr & Mrs Thomas Hartley my great grand parents on my father's side of the family. This was once the only cottage standing along the whole length of the High Lane, in those days it must have been a very lonely place. Burglar alarms had of course not been invented and my great grandmother always kept a policeman's cape and helmet hanging on a peg near the front door. This would deter any unwelcome visitors who happened to open the door. 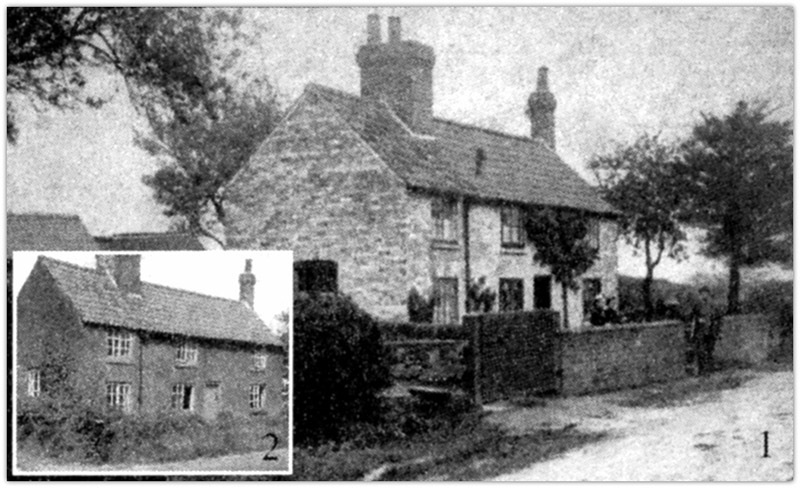 Photograph one shows the cottage at the time when my great grand parents lived there. Photograph two was taken just before it was demolished in 1979. This was done to accommodate the space to build the semi-bungalow (number 101). The stone wall in the foreground of the picture still remains and forms the retaining wall for the bungalow's garden and drive. The actual drive now giving access to the fields was diverted during the building work. These fields today are owned by Mrs. Hicklin from Nottingham and farmed by Mr Bill Smith of Brook Farm Mapperley Lane. You will notice the first photograph has a stile which many people thought was a public footpath, but in fact this was a private track to the local mines. The mine owners paid a toll, allowing access for the miners to walk from the main road to the pits. It was always closed on Christmas Day and Boxing Day so that it could never become an official right of way. On further inspection of the photograph you will observe the position of the well, from which water was sold to the miners on their journey to work. My family lives at number 99, the bungalow on the left-hand side of the site of the old cottage. This was one of four bungalows built in the old cottage orchard; this shows what a considerable size it was. Note also the unmetalled main road. My father also told me that a windmill once stood in the corner of the field behind the bungalows. This piece of land still remains boggy to this day, and I think this was probably a wind-pump. Next month: a trip through the gate to find more secrets! 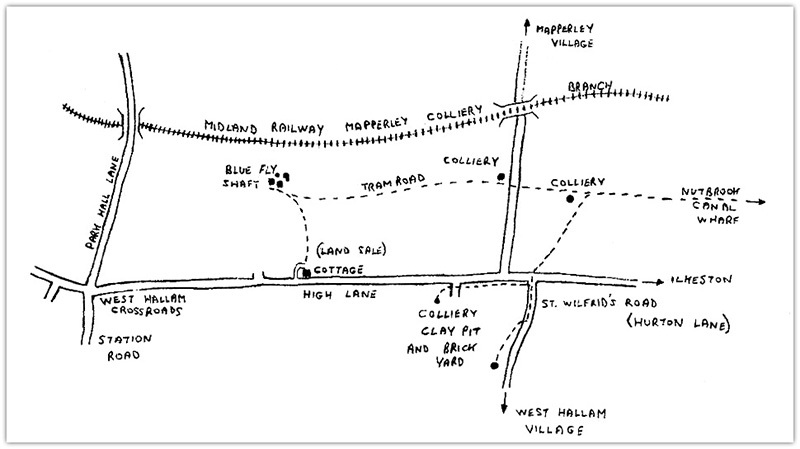 The first Ordnance Survey map surveyed in l835 and published in 1836, shows the tramway running from the Blue Fly shaft to the Nutbrook Canal wharf (above diagram). The branch-loop can be seen leading to the High Lane landsale. A further branch line can also be seen turning right, towards St Wilfrid's Road. This crossed the field, where it again branched off to another colliery, claypit workings, and a brickyard all situated along the High Lane and Hurton Lane (now St Wilfrid's Road). The Mapperley road junction was not a crossroads at this time, but it was later shown on the 1895 Ordnance Survey. After passing over two further stiles, the remains of a spoil heap can also be seen in Bill Boame's field, enclosed by hawthorn bushes; this is to the left of the gate, just before you cross over Mapperley Lane. On crossing the road, pass through Bill Smith's farmyard; the path cuts through a much larger spoil heap, which is now a woodland area. It was just past this point that the branch line leading to StWilfrid's Road led off to the right. Unfortunately from this point all signs of the tramway are now lost. The footpath enters the area, once occupied by the old NCB coal-screens, recent workings have destroyed all traces of the plate way. If you looked closely at the photograph of Orchard Farm, in my last article, you could just see Mr & Mrs Hartley. 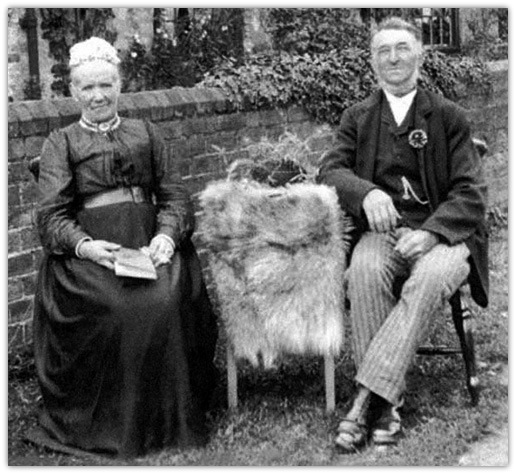 This month's photograph shows them in their Sunday best, sitting by the roadside. (It would be impossible to do this today!) The farm had such a large orchard - an apple cellar had to be built to store the vast amount of fruit. This could be seen as you went through the main gate on the left hand side of the cottage. The cellar was so large that during the war the cottage tenants Mr & Mrs Arthur Lawley used it as an air raid shelter. This was finally demolished to make way for the new drive, for the bungalow at number 101. On entering the large gate into the farmyard a huge cowshed was built. For those of you who went to the Old Boys' School, you will no doubt remember seeing the splendid stuffed badger mounted in a large glass case. This was moved to the new school when it was built, where it was placed in the science lab for years being used as a visual aid in hundreds of biology lessons. This specimen was shot in the cowshed by my great grandfather, where it was found attacking the cows. TB was prevalent in those days, and it was feared the disease would be passed onto the cows from the badger, so for this reason it was shot. Next month: a further trip through gate and into the fields. In my first article, I mentioned a windmill located in the fields belonging to the farm and stated that I thought it was probably a wind pump. 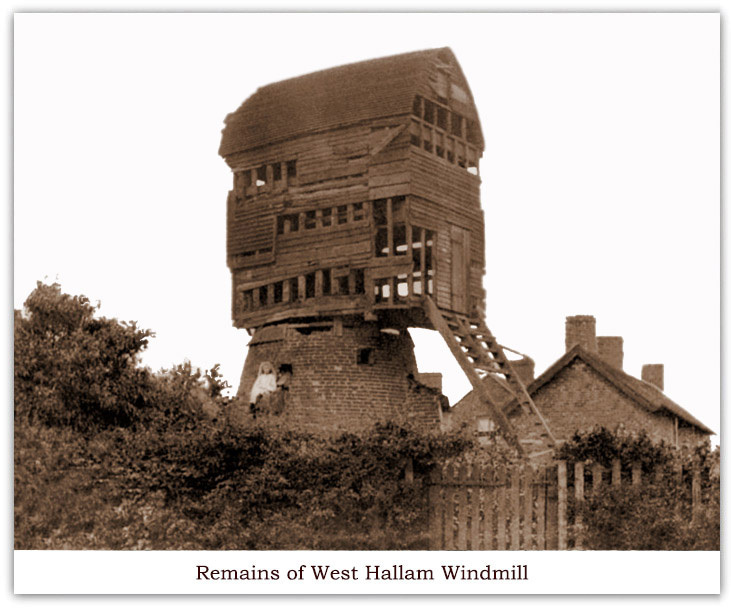 Someone who excavated the mill foundations several years ago, has now informed me, that it was a corn windmill (built to the same construction as the mill which once stood near Millhouse Garage, West Hallam Crossroads). The excavated mill stood in the field at the back of our bungalow, number 99. If you move into the next field, there is more than at first meets the eye. To see it, you will have to go down the foot path just below Hartshorn's Garage. After two fields you will come to a stile, here the footpath divides into two, this area is known as Bluefly. This takes its name from a Pumping Engine, installed in 1825, to remove water from a coalmine near this location. On closer inspection, you will see the remains of a horse-drawn Tramway, which carried coal down to the Nutbrook Canal. Photo No. 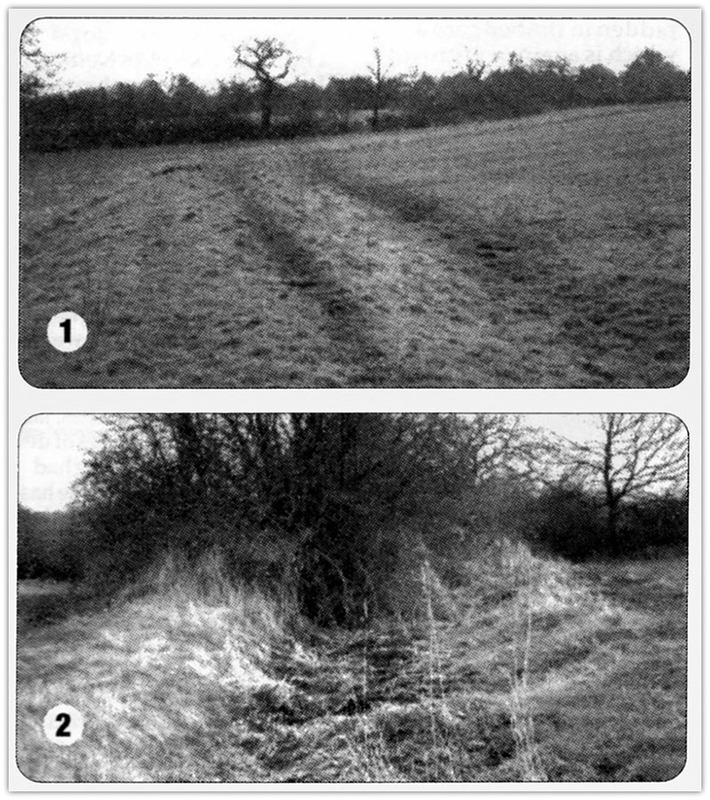 1 (above) shows the remains of the Tramway embankment which carried coal up to the High Lane, where it was sold at a land sale wharf, this was a branch line off the main track, it was installed in 1935 and terminated at the farm gate. Photo No. 2 shows a cutting which is now much overgrown, this is in the same field as the previous photograph, the Tramway went through this cutting then over a bridge passing over a ditch, brick foundations can still be seen scattered, with remains of stone sleeper blocks. At this point you pass through a stile hidden in the hedgerow, which is again overgrown leading into Mr Bill Boam's field. Next month: more on the construction and details of the Tramway and other uses.